I suppose I could continue to wait until I have a ”proper diagnosis," (do those exist)? 🤷🏻‍♀️ But since it’s May that means it is Ehlers Danlos Syndrome (EDS) and Hypermobility Spectrum Disorder (HSD) Awareness month, I figured now was an ample time to share-so here it goes! Through clinical observation, it's been determined that I have Hypermobility Spectrum Disorders (HDS) and potentially Ehlers-Danlos Syndrome (EDS). We're not sure what subset of EDS yet. HSD is a group of conditions related to joint hypermobility. EDS is a group of connective tissue disorders that can be inherited and vary both in how it affects the body and in the genetic causes. HDS seems to explain many of my unexplainable symptoms, chronic pain, and general oddities that I’ve dealt with since early childhood. Over the last year, I've been piecing the puzzle together slowly and treating these issues instead of numbing migraine pain. It's a lot to wrap my foggy brain around. Regardless of the proper diagnosis, this has lead to valuable insight to manage my chronic pain. I work with a physical therapist 2-3 times a week to improve the ”YES/NO” joint, because I have stiffened muscle tension in my C0, C1, and C2. The goal is to create mobility where muscle tension is increased and to stabilize the muscles in the rest of my neck which is terribly lax and hyper mobile (and very painful)! My shoulders are “severely depressed," I'm working to strengthen my trap and serratus anterior also to reduce recruitment of the elevator capita and lat. To manage this condition I’ve decided to take matters into my own hands. Movement has become medicine. You know all those THINGS you've always wanted to do? You should GO DO THEM! Well idk that I ever wanted to do 16 hours of Pilates in one weekend BUTTTTT, I AM very proud to be an apprentice at Pilates of Kansas City! I am lucky enough to be in this program with some badass babes, each of them has taught me something already. I am excited to grow more with these ladies over the remainder of our trainings together! We were instructed by Elisabeth David, who I admire as an instructor. 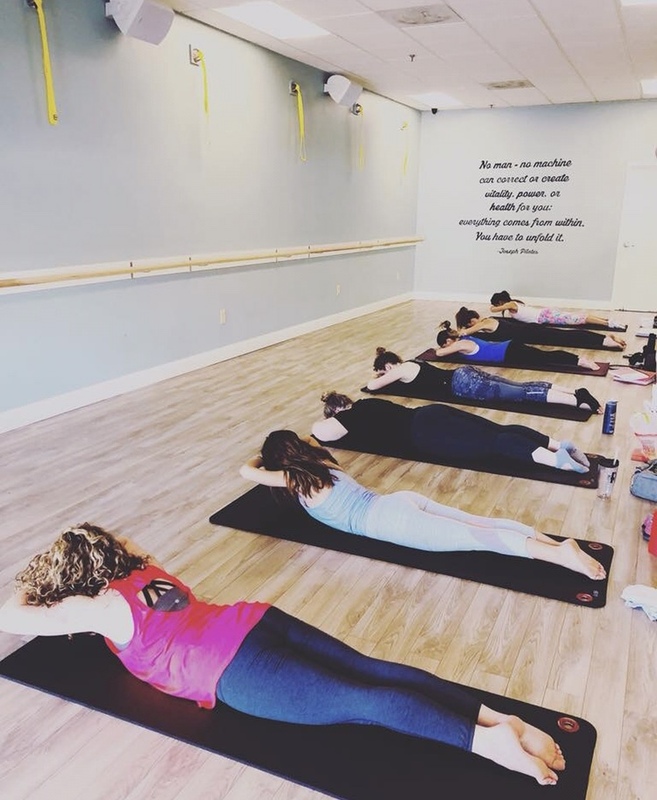 She taught us about the foundational exercises of the Pilates Method, including progressions and modifications, the basics of anatomy, and how to safely teach a Beginner Mat Pilates class. 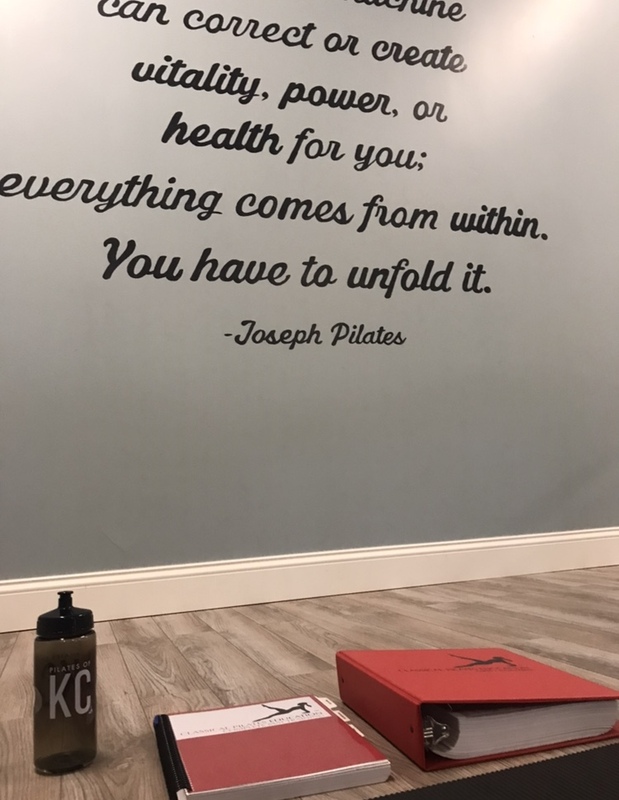 (I personally geeked out over the history of Pilates and plan to read up on Joseph Pilates because he sounds fascinating!) More than that, Liz is encouraging us to find our own confidence and teaching style. It takes a lot of courage and focus to get up in front of a room and lead- regardless of what you’re leading. 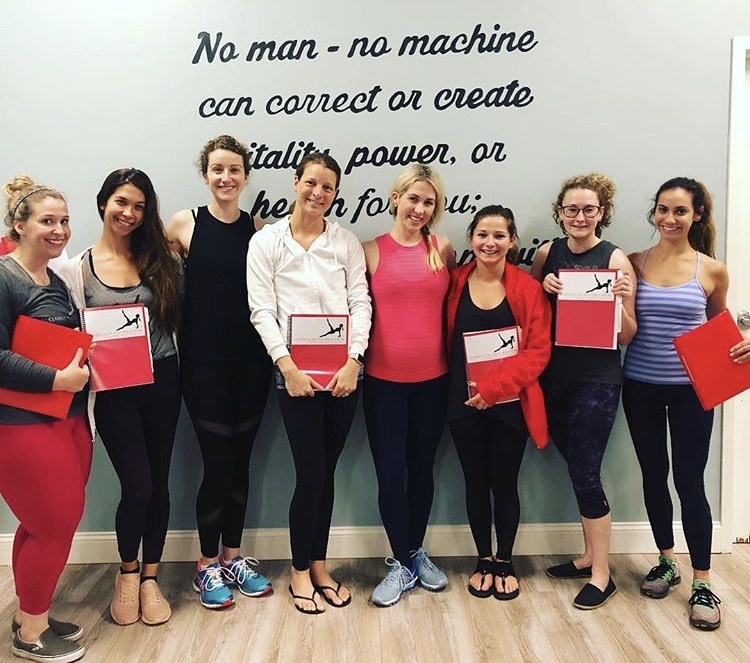 It’s a huge comfort to be among a group of open, understanding, kind, driven, and strong ladies as we learn how to become Pilates Instructors! Onto Beginner System in June!